The Company – Custom-Pak, Inc.
molded plastic products since 1974. The company designs and manufactures blow molding machinery, builds blow molds, develops automation systems and holds numerous product, process and technology patents. The Product Development Centers imagine, design, create and introduce at least one all-new product to the market every day (usually requiring multiple molds). Six manufacturing plants operate over 200 state-of-the-art blow molding production lines in North America. Each plant is registered to the ISO9001-2015 quality standard. Employees enjoy a safe, friendly, clean and modern workplace with above average wages & benefits. They remain engaged through open communication and meaningful profit sharing. A Machinery Development Center and an Automation Technology Center continually advance efficiency, repeatability, safety and production capability. 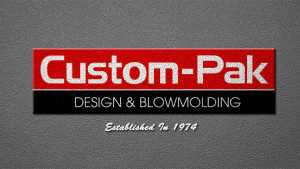 Custom-Pak manufactures blow molded products for leading companies in more markets than any other blow molder. Their breadth of experience in the hardware, appliance, lawn & garden, seating, electronics, housewares, toys, construction, sports, recreation, medical, automotive and other industries provides product experience that is unmatched. Innovative design, technical development and proprietary processing machinery help make Custom-Pak the low cost producer in these industries and allows Custom-Pak to provide customers with true blow molding excellence.